From November 25 to 27, a big regional horticulture event took place in Kigali, Rwanda, organized by the Rwanda National Agricultural Export Board (NAEB), the Private Sector Federation (PSF) and AgriProFocus together with partners and sponsors. The event consisted of a three-day horticultural exhibition at the PSF Expo Grounds, combined with a two-day conference about Innovation and Trade in Horticulture. A Business Innovation Competition took place during the event as well. The exhibition attracted hundreds of participants whereas over 200 people participated in the conference. Objective of the event was to facilitate business-to-business meetings for horticultural producers, traders and input suppliers from the region, as well as to foster exchange and learning about horticultural innovations between stakeholders: farmers, private companies, knowledge institutes, governmental agencies and civil society organisations. Please follow this link to watch the after-movie of the event on YouTube. 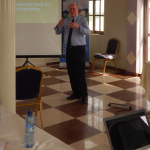 According to Rwandan press, the event was a great success: see for example the article in the New Times. Minister of Agriculture and Animal Resources Gerardine Mukeshimana (see picture) opened the conference saying that “development of this sector can have a great impact on poverty reduction”. Chief Executive Officer of NAEB Ambassador Kayonga highlighted the potential of regional trade to expand Rwanda’s market. The conference provided space for extensive exchanges and discussion about innovative horticultural production practices. Participants showed particular interest in solutions for addressing postharvest losses, including improved cooling, storage, packaging and processing of fruits and vegetables. The potential of regional trade in horticultural products was discussed extensively: regional markets offer chances that national or global markets cannot always deliver, though still many obstacles remain for successful regional trade, both from a practical and an institutional and legislative nature. The regional horticultural exhibition and conference took place in parallel to an incoming trade mission from the Netherlands facilitated by NABC and Greenport Holland/DHTB, which included members of the SMART consortium such as Bosman van Zaal, Koppert, RijkZwaan and Wageningen UR. These companies and knowledge institutions with expertise in horticulture had the opportunity to meet with regional business representatives at the ‘Holland lounge’ of the exhibition, and were among the conference speakers the following day. This lead to interesting exchanges about technological and process interventions Dutch stakeholders could offer to the producers and value chain actors in the region, but also about the areas where ‘demand’ and ‘supply’ did not really match. The trade mission proved to be successful as all companies gained useful contacts and are currently in the process of exploring business opportunities and partnerships. During a breakout session facilitated by the Food & Business Knowledge Platform (F&BKP), the report “How does the Fruits & Vegetables Sector contributes to Food and Nutrition Security” (LEI/WUR) was presented and discussed. Horticultural experts and practitioners from various countries in East Africa responded positively to the report, and supported the need to clarify further how interventions in this sector could generate a positive impact for the development of rural communities and for people’s nutritional status. They shared experiences with several community-oriented agricultural services models, such as the Community Agrodealer model of the USAID programme Profit+. They advised that services be delivered very close to the communities, and be based on the needs of local producers, in order to have the desired impact to combat poverty. They also discussed how a nutrition impact of horticultural interventions could be promoted, and focused on the need to raise awareness on the importance of consuming fruits and vegetables and of improved cooking habits. In East Africa, both children and adults eat too little fruits and vegetables, and often the famous green leafy vegetables are cooked for too long, until no vitamins are remaining. Finally, they stressed the need to develop women’s and youth’ empowerment oriented interventions to enhance the inclusiveness of horticultural value chains. As part of the conference and exhibition the Business Innovation Competition finals took place, with 14 candidates who had won national-level qualification contests and had been awarded with a fully sponsored trip to attend the event in Kigali. The Business Innovation Competition awarded key innovations in horticulture in the categories of productivity, market access, access to finance, regional trade and social impact (gender/youth environmental aspects). Ultimate winner of the competition was AfriBanana Products (ABP) from Uganda. They have managed to add value to banana especially the cooking type known as Matooke. ABP has successfully increased the shelf life of the Matooke from one week to six months. It has managed to utilise almost 90% of the plant which used to be left to waste. ABP has extracted wine, juice, charcoal briquettes, shopping bags and clean planting materials. Number two in the competition was Zelo Foods Limited from Zambia. They have turned inferior peanut powder, from peanuts grown by peasants and sold by street vendors, into a prestigious, high value and nutritious product now sold in middle and upmarket supermarkets. EcoLife Foods from Uganda was awarded the third prize with the innovation idea of a low cost insulation technology for cold storage facilities by recycling plastic waste bottles. A full report from the conference and the Business Innovation Competition will be published in January on AgriProFocus’ online platform. 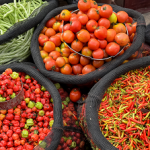 How to improve the enabling environment for trade in horticultural products? What are the most promising innovations for value addition to fruits and vegetables, for the reduction of post-harvest losses, and how could these be turned into viable business models? 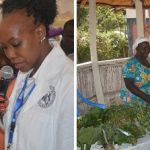 How could women and youth empowerment be promoted further in horticultural value chains? Effective strategies to raise awareness about the importance of consuming more fruits and vegetables and to improve cooking habits at community level. There was a clear interest to foster multi-stakeholder networking in the horticultural sector both at national and at regional level, and to link the knowledge of practitioners to research and development by higher learning institutions and research centers. Thank you for your interest in the Food & Business Knowledge Platform. You can find more information on Horticulture on our Fruits & Vegetables theme page: https://knowledge4food.net/theme/fruits-and-vegetables/.